It is my feeling that Freemasons are by nature creative people, that is serious students of the Craft and not MINOs (Masons In Name Only). Some serious Freemasons are painters, some are sculptors, some are publishers, some have radio programs, some are musicians, some are actors, some own and operate large Masonic websites, others Masonic Internet Forums, some are magicians, many are teachers and clergy and a whole bunch are writers. And if an active Freemason doesn’t fit into any one of those categories he will at least tend to be a prolific reader. Now not all Freemasons fit into this mold but the percentage that do are very high. A person in the arts sees something in Freemasonry that draws them to it. Twenty-eight year old Brother Hando Nahkur fits the mold described above. 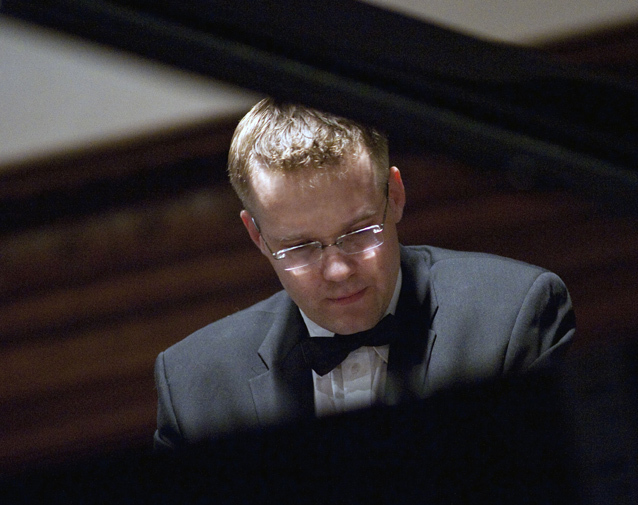 He is a concert pianist, a native Estonian who came to the United States 8 years ago. His first stop was Yale University in Connecticut where he spent 3 years studying music with Boris Berman, followed by 2 years at the New England Conservatory of Music in Boston with Gabriel Chodos, and then 3 years in the music program at Texas Christian University (TCU), Fort Worth, Texas where he is still matriculating under the tutelage of Tamás Ungár. Nahkur is not done with his studies at TCU. Already in possession of a Masters Degree in Music he hoped to finish his DMA (Doctor of Music Arts) but an opportunity has risen, a great honor, which he cannot turn down, that will delay his further education. He will participate in the quarter finals of the 9th F. Liszt International piano competition at the Spring Festival in Utrecht, The Netherlands in March 2011. Auditions took place in Shanghai, Moscow, Utrecht and New York City. Over 200 pianists auditioned but only 24 were chosen, and Nahkur was one of those 24. Nahkur also studied in Estonia before coming to the United States. He made his debut with the Estonian symphony orchestra at the age of sixteen. He went on to perform with the Orchestra of the Estonian National Opera. While he frequently performs solo Nahkur has performed with the Bergslagen Symfoniker, the St. Andrews Festival Orchestra and the Fort Worth Symphony Orchestra. He has played at the Amersterdam Concertgebouw in the Netherlands, the theater of Markopoulous Mesogeas in Greece, Vienna Konzerthaus in Austria, H. Reimann Hall in Switzerland, the Teatro Eden in Italy, the Casa de la Cultura de Reynosa in Mexico, George Weston Hall, Toronto, Canada, Harris Concert Hall, Aspen, USA, Isabella Stewart Gardner Museum and Jordan Hall, Boston, USA, Steinway Hall, New York City, USA, Ed Landreth Hall, Fort Worth, USA and the Museum of Fine Arts, St. Petersburg, USA to mention a few. He has played in 22 of the states of the United States, in Costa Rica, Italy, Sweden, Germany, Finland, Estonia, France, The Netherlands, Belgium, Czech Republic, Israel and Russia. Nahkur has garnered top prizes in both national and international piano competitions, including top prizes in Estonia, Italy, Greece, Russia, USA and Canada. In 2005 he was awarded the Golden Medal of Merit from Toronto, Canada. Nahkur in addition to being a performer is an arranger of music and he plays and arranges some popular and romantic music as well as classical pieces. He also teaches music part time. His favorite classical composer is Liszt with Chopin and Schubert runner ups. His upcoming concerts include Boynton Beach, Florida in February and his native Estonia in April. He is ecstatic with the rave reviews he has received on his latest CD, DeusExClavier. On his coming trip to Utrecht, Brother Nahkur hopes to go to Lodge there and meet Freemasons from the Netherlands. He speaks Finnish, Estonian, Italian and English languages. If you were to talk to Nahkur there are two character qualities that would stand out, his passion for what he does and what he is and his discipline. There only remains to be said – not bad for a man of twenty eight years.